TOKYO, Japan, August 10, 2013 (ENS) – Radioactive groundwater leaks from the damaged Fukushima Daiichi nuclear power plant are increasing every day, and Prime Minister Shinzo Abe has ordered the government to step in to help plant’s operator, Tokyo Electric Power Company deal with the radioactive flood. Japanese officials estimate that 300 tons of radioactive groundwater may be flowing into the Pacific Ocean each day. Recent torrential rains in Fukushima province have caused groundwater levels to rise, and the groundwater becomes contaminated with radioactivity while flowing across the nuclear power plant site 220 km (130 miles) northeast of Tokyo. The radioactive groundwater has risen above a barrier being built to contain it. Fukushima Daiichi was disabled March 11, 2011 when a massive tsunami triggered by a magnitude 9.0 earthquake knocked out cooling systems at the nuclear plant, sparking meltdowns, a series of hydrogen explosions and the release of large amounts of radiation into the environment. Tens of thousands of people remain evacuated from their homes and businesses in a 20 kilometer exclusion zone around the plant. Fully restoring those areas is expected to take decades. On Thursday, Japanese environmental groups and Diet members held a meeting with Japanese government officials concerning the radioactive discharges into the Pacific Ocean from the Fukushima Daiichi site. The meeting was held in Tokyo at the Upper House Diet Office Building. After the meeting, Chief Cabinet Secretary Yoshihide Suga said the government will make more funding available to curb the flow of radioactive water into the ocean. But the Japanese group Green Action, which helped to organize the meeting, warned that the funding will be too little, too late. “The government says it will assign a budget to deal with this problem, but it’s for the next fiscal year, plus, the countermeasures are grossly insufficient,” said Green Action. The groups object that instead of focusing on the problems at Fukushima Daiichi, Japan’s Nuclear Regulatory Authority is devoting its time and attention to assessing other Japanese nuclear power plants for planned restarts. 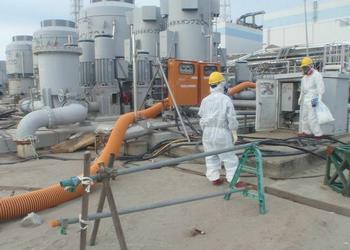 Nearly all Japanese nuclear power plants were shut down following the Fukushima disaster. Currently, only two of Japan’s 50 nuclear power reactors are operating, Ohi Units 3 and 4. TEPCO acknowledged in late July that the radioactive water had been flowing into the sea at Fukushima, sidestepping its previous statements that radioactivity of the water could not be confirmed. TEPCO has begun its own pumping operation, pumping up radioactive groundwater at the nuclear plant to keep it from flowing into the sea. Company workers dug a small well near an embankment facing the sea and began pumping up groundwater on Friday afternoon. The pumped-up water is moved to an underground trench and then stored in tanks at the plant. The utility has hardened soil near the embankment since last month to prevent radioactive groundwater from entering the ocean. TEPCO said it will also put nearly 30 pipes, each five meters (16 feet) long, in the ground near the embankment next week to pump up more groundwater. Company officials say they hope to draw up about 100 tons of groundwater a day with this method. TEPCO President Naomi Hirose said the company first suspected the water was spilling into the ocean on June 19 when strontium and tritium were found in a monitoring well at the nuclear plant. In late July, TEPCA officials apologized for failing to publicly acknowledge sooner that the radioactive groundwater was leaking into the ocean. “The major cause of this was that there was great fear, within the whole company, of alarming the public of an outflow incident guided solely by guesswork, without crucial evidence, and particular anxiety and concern about damage to the fishery industry resulting from harmful rumors. We felt it best to reserve judgment until we could establish ‘definitive grounds,’ rather than announce the associated risks immediately,” TEPCO said in a statement July 26. But the information became public anyway and did result in public alarm. A fisheries cooperative in Fukushima Prefecture has stopped test fishing there due to the radioactive water leaks. 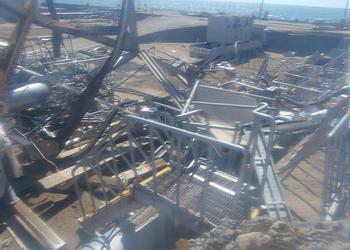 Local fishermen suspended commercial operations after the nuclear accident in March 2011. The Soma-Futaba Fisheries Cooperative had test fished north of the prefecture since June 2012, to get ready for a restart of commercial fishing. Radioactive levels of fish samples from the area are below allowable levels, but the cooperative decided to stop because consumers might doubt the safety of its catch. Fukushima Prefecture is getting help from the UN’s International Atomic Energy Agency, IAEA, to deal with the radioactive contamination from the nuclear power plant. An IAEA expert mission composed of 16 experts from eight countries and IAEA staff visited Fukushima Prefecture from July 21 to 26, to start implementation of the “Practical Arrangements,” a set of signed agreements between the Fukushima Prefecture and the IAEA. The three-year assistance plan focuses on issues of remediation, decontamination and low level radioactive waste management in Fukushima Prefecture. The remediation efforts aim to prevent the movement of radioactive contaminants into waterways, the food chain or air. The IAEA team also conferred with Fukushima Prefectural officials on the various steps taken for the safe management of materials that contain traces of low level of radioactive nuclides, assistance for temporary storages sites for possible contaminated materials. Another issue discussed during the meeting was to undertake a survey of radionuclides in the environment, including its absorption in soil, and the examination of status radionuclides in rivers and lakes and mapping surveys of the Fukushima Prefecture for dissemination to the public. First commissioned in 1971, the Fukushima Daiichi plant consisted of six boiling water reactors that produced 4.7 GWe of power, making Fukushima Daiichi one of the 15 largest nuclear power stations in the world. The plant will not reopen and decommissioning is underway.